It also is compatible with a wide range of hardware, from a Raspberry Pi to a Desktop computer. 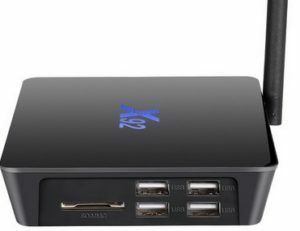 There are also many small android TV boxes that are widely popular to use with Kodi. The nice thing about android TV boxes is they come in all shapes sizes and cost amounts. There is high-end units like the Nvidia Shield and many low end-units that get the job done. This post is for those who are on a budget and looking for the cheapest working good Kodi unit available. One place that budget units are sold is on AliExperss which has a huge selection of hardware. 2017 is almost on us and hardware has improved drastically from a year ago. Last year the minimum recommended hardware specs for a android box to run Kodi was a S805 procesor and 1GB of RAM. In 2017 the minimum recommended hardware for a android Kodi box should be a S905 processor and 2GB of RAM. The newer S912 processors are even better than the S905 so they would also be a good option. Internal storage is always limited on a budget box with expanding space usually done via a USB flash drive or SD-Card. A external hard drive is also a good option. The biggest factor for internal space is to load the operating system and apps such as Kodi. Since all movies and TV shows are streamed online there is no need to have a large internal storage as it simply runs up cost. If you do have a large video libary you would like to watch than using a flash drive, SD-card, or external hard drive is best. Of course there are expensive units that can be bought with large internal storage, but this post is about low cost units. Internal storage should be at least 16 GB to help future proof it when Kodi 17 Krypton is finally released. Kodi 17 does have Betas that can be downloaded and instaled which do work well. Some boxes are being sold with the Kodi 17 Beta version installed. I have run kodi 17 Beta version and have had no real issues yet but if in doubt get a Kodi 16 Jarvis unit. Keep in mind any version of Kodi can always be installed on most any android TV box. With that in mind lets look at some good unit on AliExperss. Prices are always changing on AliExpress so the units below are simply examples of what to look for, with many more units available in a simple search. Here is a unit that while not the cheapest has some impressive hardware for the price . It comes with a new S912 CPU, 3GB of RAM and 16 GB of internal space. This is some good hardware that will be future proof when the new Kodi 17 is finally released. This box also has some good hardware with a S912 Octa Core CPU, 2GB of RAM and 16GB of internal space. It comes with Kodi 17 installed which may not be the best for stability since it is still in Beta. Remember Kodi 16.1 is in the Google Play store and easily installed. Add-ons are also easily installed with many tutorials here and elsewhere. The best deal on our list is this unit with a S905 CPU, 1GB of RAM, and 8GB internal storage. Kodi 16.1 come installed and ready to run. While it does only have 1GB of ram this is plenty enough for Kodi 16.1. When Kodi 17 is finally released there will not be a need to update immetadlty. To give and example I have a few units that still use Kodi 15 Isengard that continue to work well. Like versions of Windows after a new version is updated the old version can still be sud as long as the software works. In the case of Kodi this means the add-ons need t be compatible and able to stream with little to no broken links. The above units are just a few examples of some good units on AliExpress, but there are many more available. If you need a very low cost box than there are lader units using a S812 or S805 processors that will work currently with Jarvis 16.1. Simply don’t upgrade a older box with 17 Krypton when it is released. With the above examples and basic of what to look for searching for at AliExpress, you can no-doubt easily find a good unit that will stream well and have you watching movies and TV shows. Try doing an uninstall of the Javis, and do a side install of the 17.5 kodi. Do this from a flash drive using the apk from Kodi’s website. That should get’er done. hi.. i bought x 92 with 3g ram, 32 g internal storage.. i tried updating to kodi 17.1, but system kicks me back to installed 16.1, after downloading 17.1 on kodi site.. is there a reason, or am i doing something wrong?